“What on earth do we do with those purple elderberries in Autumn,” asked Erik. Not being entirely sure, I decided to trawl through cookbooks and the internet to find out the answer, as we have a big bush, almost a tree, only a few yards from our brand new kitchen. 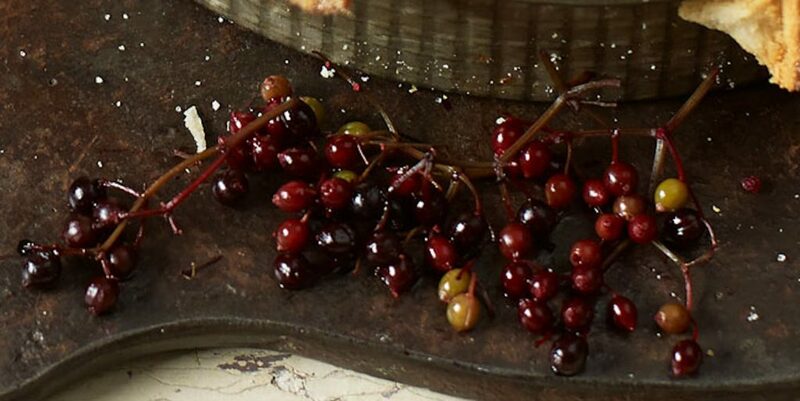 Autumn elderberries – courtesy of Good Food. Our Elderflower bush/tree is really in our neighbour’s garden, but overhangs our garden and path, so much so that I have clipped it to make a tunnel, so that we can walk underneath. Complete with quite a large bird’s nest hidden in the tangled branches, I suspect we have competitors for these luscious purple berries judging by the number of pigeons also into foraging this ripe fruit. We had better get in there quick if we want to use any of it! Tips for using Elderberries in Autumn. Make sure you pick deep purple/almost black berries, not bright red or green ones. Don’t wear your best white clothes when foraging for these ripe Autumn elderberries. I put on my old plastic apron, because the juice will stain clothing quite badly. To remove the berries, use a fork in the same way you do for currants, red, white or pink. Just hold the stalk and run the fork prongs gently down, trying not to squash the juicy berries. Always wash the ripe berries. These Autumn Elderberries must always be cooked, not eaten raw. Elderberries in Autumn can be used in a variety of ways. In Syrups, mixed with Alcohol such as Vodka, lovely mixed with Apples and Blackberries in Crumbles and pies, to make Wine, Cordials and even Jams and Jellies. Autumn Elderberries can even be folded into bread dough. As I love Almonds, I found this great Autumn recipe from BBC Good Food. by Adele Nozedar. See what you think to it. 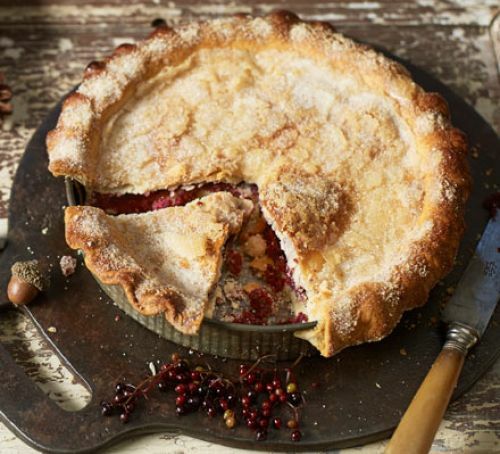 Elderberry & Almond Pie Recipe. Elderberries in Autumn – courtesy BBC Good Food – Adele Nozedar. This sounds like an interesting pie to make using elderberries, but I think I would add slices of either Bramley or eating apples to bulk it out and add a bit more moisture. Going to have a go at this one if the greedy birds have left us some berries. Would love to team it with some good vanilla ice-cream. Make a syrup first by washing the berries well and stripping them from the stalks. Tip them into a pan with 2 tbsp water and half the sugar. Simmer for 10 minutes and add more sugar if you think you need it. After 10 - 15 minutes the syrup will have thickened, at which point let it cool and strain through a fine sieve to get rid of any pips. Set aside. Heat the oven to 180C/160C fan/gas4. Roll the pastry out on a lightly floured surface and cut into two circles - one enough to line the base of a 20cm pie dish and the other for the lid. Grease the pie dish with the butter and line the base with the larger round of pastry. Scatter over the ground almonds then pour the elderberry syrup on top. Brush the edges of the pastry with water and drape over the lid and press or crimp the edges together and make a small hole in the middle of the pie top. Brush the top with water or beaten egg and sprinkle with the remaining sugar. Bake for 40-45 minutes until the pastry is crisp and golden. Leave to cool a little then enjoy warm, cut into slices with creme fraiche15 min yoghurt or ice cream. I’ve always enjoyed doing a bit of research, especially about food, historical food even better. So what to do on a very dark, wet, East Yorkshire day, and me still with a rotten cough. Trawl my books and the internet for more info about Elderberries. And I’ve come up with an unusual one. Take a look at this recipe, from a brilliant blog called Eatweeds. This Elderberry Recipe is an alternative to traditional Balsamic Vinegar. Robin says it is "Deep, rich and beautifully smooth and it goes extremely well as a salad dressing. It can also be used as a 'hot toddy' to ward off the Winter sniffles. Put Elderberries in a bowl and pound lightly with the end of a rolling pin. Pour over the red wine vinegar and cover with muslin. Leave for 7 days. Strain through a fine sieve and pour the liquid into a stainless steel saucepan. Add the sugar and warm gently until dissolved. Keep stirring so the sugar doesn't burn or start to caramelise. Then bring to a rolling boil and simmer for 10 minutes. Now pour into sterilised bottles and cap. Make sure you use a cork or plastic topped caps otherwise they will corrode due to the vinegar. The writer of Eatweeds, Robin Harford, even recommends using this vinegar recipe as a “Hot Toddy”, and because of how I’m feeling, I may well do this – except I just read the recipe again and it takes over 7 days of steeping the berries in vinegar! Oh well, hopefully my cough will be gone by then. Time to stop writing about Elderberries in Autumn until I find a few more recipes. I need to go downstairs to our new kitchen and liquidise gallons of my Tomato Soup. It is my all-time favourite recipe, and the amount I have made should keep Erik and myself in Tomato Soup for most of the Winter. I must confess that I love this time of year – there is so much fantastic produce around, especially when we are attempting to grow a lot ourselves. This year, I suppose my health hasn’t helped, but hopefully next year should see us up and running more efficiently with our raised beds, mini-orchard and edible hedging. Roll on 2018.